I couldn't resist doing this layout about my daughter's darling dappled dachshund! Wit is the cutest little guy, and always makes us laugh when he comes to our house for a visit. When he was about a year old, we took him to have his picture made with Santa, and I don't know who was more unhappy....Santa or Wit. What a moment to remember!!! If you haven't stopped in at the Crafty Scrapper and seen the brand new Tulle Pleat Trim by Maya Road, you've got to do that...and stock up! Here, I've used the color, Cinnamon, to add definition to the center of the layout, and loved working with it.....I have more ideas for this lovely trim in later projects! Patterned papers used here are Bo Bunny's "Father Christmas" and "Blitzen". What a treat they are to work with! 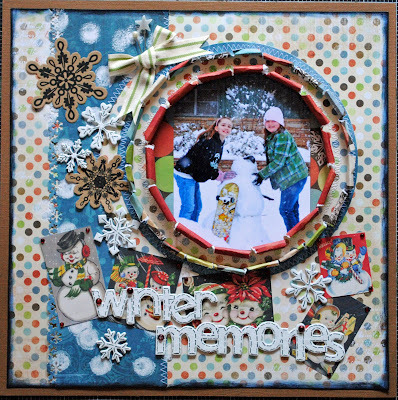 Other supplies used are Maya Road's Mini Set, "Autumn", red Mini Market Stickers by October Afternoon, Cream Making Memories paint, Diamond Stickles, "Let It Snow" Kraft and "Time Flies" Kraft Clocks by Maya Road. 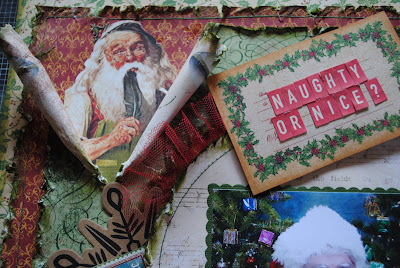 "Peeled Paint" Distress Ink by Ranger/Tim Holtz gave tons of definition to the edges of the distressed paper. Techniques used in this layout include tearing, distressing, inking and rolling of paper. Also, machine stitching and fussy cutting helped to create additional detail. You know that in Texas everything is bigger and better, right? Well, the same thing applies to scrapbooking here in The Lone Star State. If you think that one frame of torn, rolled and stitched paper looks good, just IMAGINE how good TWO concentric, torn, rolled and stitched circles would be!!! LOL!!! 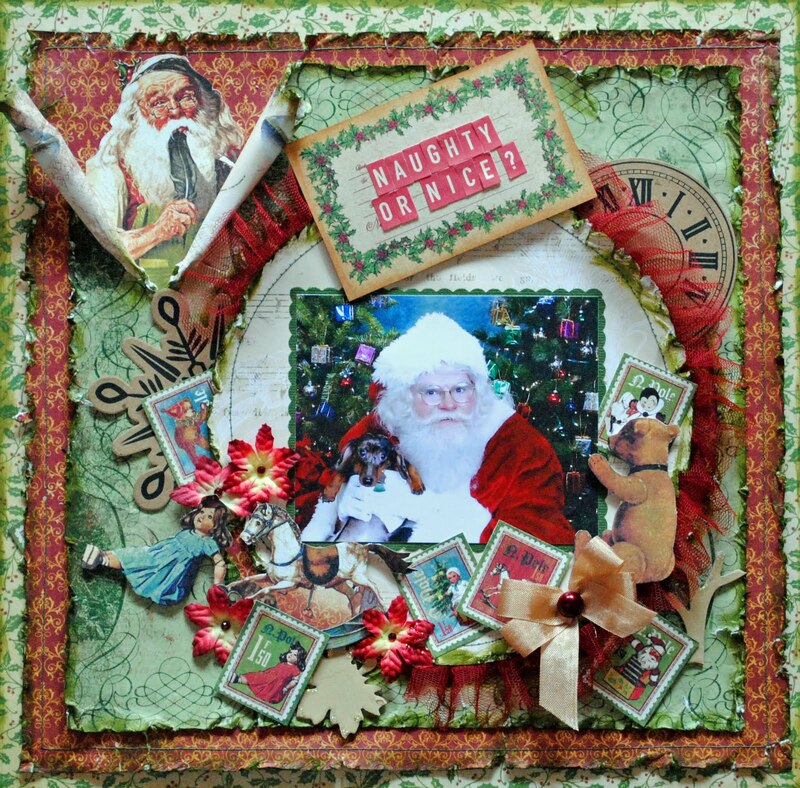 This layout was created with the new Bo Bunny Collection, "Blitzen", which is cheerful and fun to work with. 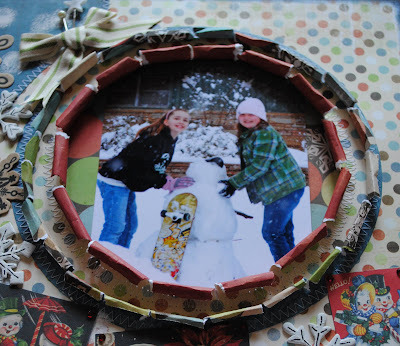 Other patterned paper used in this piece is "Snowman Collage" by Reminisce. The title uses chipboard "Seasons" and "Snapshot Words", Let It Snow Craft and "Vintage Snowflakes". Also by Maya Road are the yellow "Star Trinket Pin" and the "Vintage Round Pearl" pin.The ribbon is by May Arts. Techniques used were paper tearing and curling, border punching, using EK Success, inking, stitching and doodling with my black Zig Writer. The dot theme was continued by using an Adirondack Acrylic Paint Dabber in "Snow Cap". It's time for the August ATC Swap. The challenge is to create three ATCs based on the theme JUNK. The 3 cards can be the same or completely different. The due date to have your 3 ATCs to the store is midnight Saturday, August 29th! 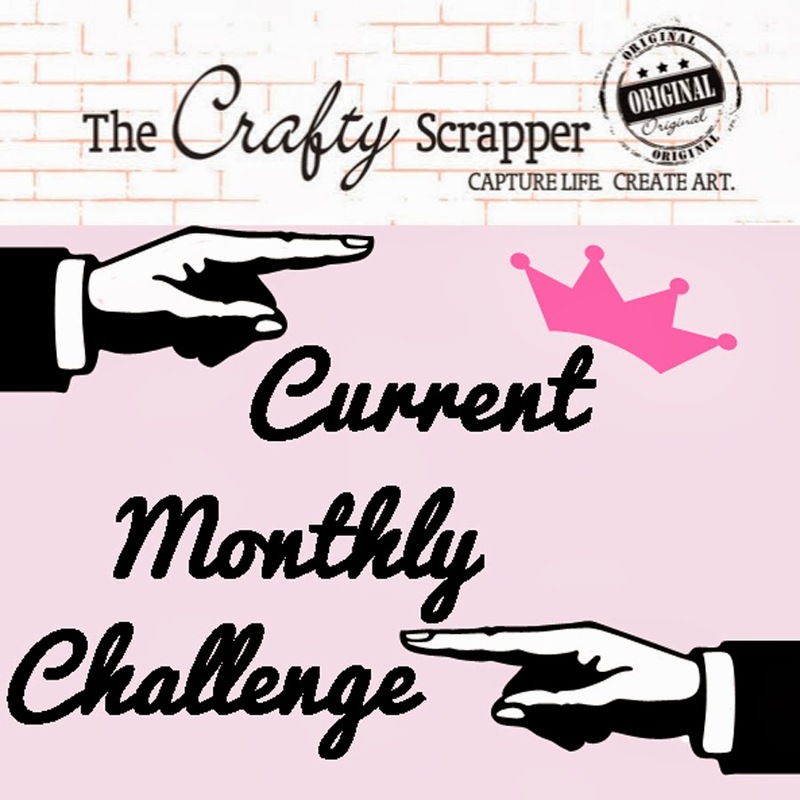 There will be no sign-up for the swap and the only deadline will be the challenge due date of August 29th. To participate in this swap, simply have your 3 ATCs to the store in the swap basket by the due date with your name on the packaging. The Swap Basket is at the pink art bar. I will then swap all the cards, and leave them in the swap basket with your name on yours at the store for you to pick up. If you'd like yours mailed, then include self-addressed packaging with postage included. "An Artist Trading Card (ATC) is a tiny, original piece of art created with the intention of swapping or trading it with another artist, not selling it. The one rule an artist trading card must adhere to is the size. An ATC must be 2.5x3.5 inches (64x89 mm). ATCs can be made in any medium and using any technique, whether it's painting, drawing, or collage. You are really limited only by your imagination and materials." Be sure to play along!